Hong Leong Asset Management Bhd (HLAM) stepped up its game to take home two group awards and two individual awards at this year’s edition of The Edge-Thomson Reuters Lipper Fund Awards. The fund house clinched the top awards of Best Equity Group (Provident), which it won for the second year running, and Best Mixed Asset Group (Provident). It won the individual awards for Best Equity Malaysia Diversified (Provident) and Best Equity Malaysia Income in the three-year category. 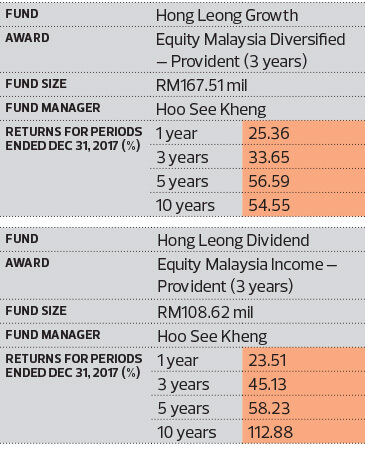 CEO Hoo See Kheng says the strength of its funds lies in the company’s investment philosophy, which is primarily based on a bottom-up stock-picking approach. “The funds were able to perform as a result of a robust investment process that was executed by a competent investment team. A good understanding of the company’s business and its outlook, as well as a comfortable level of confidence in the company’s management ability, is necessary before the funds initiate a position in the stocks,” he adds. The fund house’s strategy includes identifying possible upside catalysts while being cognisant of potential downside risks to a stock, says Hoo. On the performance of its winning funds in the provident universe, he says the funds have sizeable positions in undervalued large-cap stocks that were expected to benefit from potential inflows of foreign funds. “The funds were also exposed to selected consumer stocks that were expected to benefit from the recovery in consumer sentiment and potential government pump-priming,” he adds. The fund house’s assets under management (AUM) has been growing at a compound annual growth rate of more than 30% since 2014. “Last year, our total AUM grew 38%, mainly contributed by the strong performance of our equity portfolios and new sales from our continuous marketing efforts with our institutional unit trust advisers and agency channels,” says Hoo. On the choice of companies it invests in, he says the fund house focuses on stocks of companies that practice good corporate governance. He adds that technology has also played a significant role in driving the fund house’s success as it has brought about increased efficiency and, in general, new innovations to spearhead the entire investment landscape. “As the industry continues to evolve, so do we. We are continually exploring new initiatives and innovations,” says Hoo. For example, the company launched a fund without front loading, commission or initial sales fee last year and it saw a good response, he adds. However, this does not signal the doom of funds that have the front-loading component. “Investors are now savvy enough to understand the purpose and effect of fees and how they tie in with the services rendered. Each investor has different investment goals and, in consideration of the fees together with the financial advice obtained, would select the investment opportunities most suited to him or her,” says Hoo. He adds that this is at the core of the entire Hong Leong Financial Group. “We are aligned in this journey to continuously innovate and move forward by leveraging technology to increase our outreach. The advent of more innovative offerings has not left the industry in the lurch or led to the cutting of the agency force. “We do not see our agency business as an obstacle in implementing technology. Rather, as our agency business is relatively small and growing, we find that the introduction of technology is well received as it improves speed to market and increases efficiency,” says Hoo. He adds that the biggest opportunities for the local unit trust industry will come from the younger generation. “Our population is growing and the younger generation is even more investment savvy than before. The need to save for retirement is more widespread and this opens up more opportunities for the industry to expand the market. Despite an increase in volatility across the financial markets, Hoo says the fund house expects global economic growth to remain strong. “An uptick in market volatility this year compared with last year is expected as investors assess the impact of higher inflation and interest rates on capital markets and companies’ earnings growth. Investor interest in the Asia-Pacific equity markets is expected to be sustained due to expectations of higher corporate profit growth than in the developed markets. This year, HLAM is favouring selected large-cap laggard stocks that are trading at attractive valuations as it believes this segment may be of interest should there be foreign fund inflows. Hoo says its funds also have positions in selected export stocks, which are expected to benefit from the improving outlook for external demand. However, the funds are avoiding the plantation sector simply because of the unattractive valuations.